Sometimes it’s tough finding quick, healthy meals made from wholesome ingredients that also taste great. While there are a lot of companies claiming they have great quick meals, they usually taste like cardboard to my husband and me. Add in that you want them to be gluten-free and it feels like you are completely out of luck. 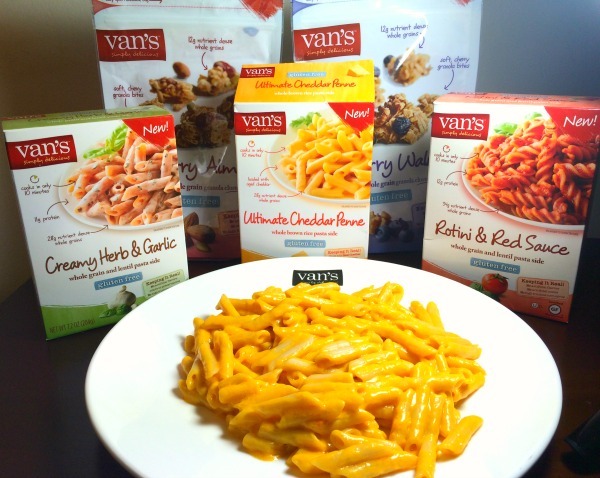 When I found out one of my favorite brands – Vans Foods – was introducing new products for people who want quick meals, I was very excited! When my box of items arrived I couldn’t wait to get the box open and start cooking! Personally, I love the Ultimate Cheddar Penne. This dish is made with real aged cheddar cheese, and uses rice penne pasta. The sauce for this pasta is out of this world. My husband and I both loved it and I am planning on buying more of it to keep in the house. Based on our own experience, I am delighted to give the Van’s Whole Grain Pasta Sides an A+ rating! Are you someone who loves granola? 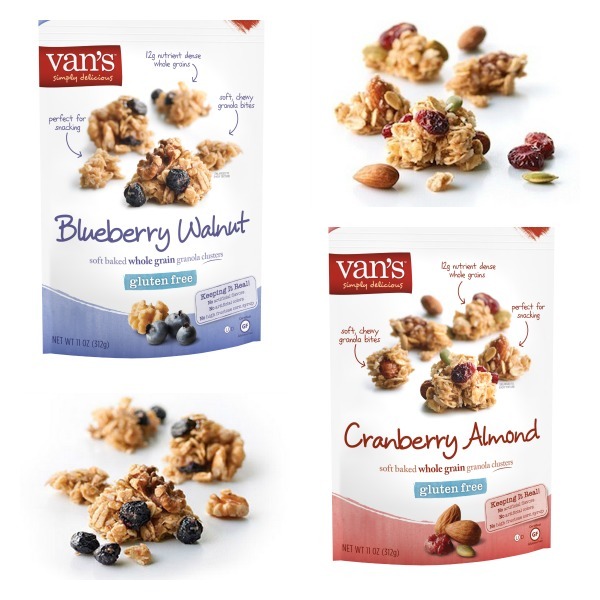 If so, we think you will love Van’s new Soft Baked Whole Grain Granola Clusters. These clusters are the perfect snack and dessert. We personally love to mix in traditional yogurt, Greek yogurt, eat them plain, or have them like typical cereal with milk. These delicious treats are certified gluten-free, egg-free, and kosher. Like their other foods, they also contain no artificial colors, flavors, preservatives, and contain no high fructose corn syrup. Currently, it is available in two flavors – Blueberry Walnut and Cranberry Almond. Like other Van’s foods, we think they are truly delicious! Based on our own experience, we are happy to give Van’s Soft Baked Whole Grain Granola Clusters an A rating. Want to try this awesome food out for yourself? You can find Vans at grocery stores, mass merchandise stores, and natural food retailers near you nationwide. To see the closest Van’s Foods dealer near you, check out their spiffy store locator. Want to learn more about their awesome food? Check out Van’s Foods on Social Media! Want to try some of these awesome foods for yourself? We are excited to be working with Van’s Foods on this awesome giveaway! 1 lucky reader will win 5 vouches for purchasing these awesome products at a store near you. To learn more, read the rules below and then enter through the Rafflecopter! One lucky reader will win (5) Vans Foods Free Food Vouchers. Sweepstakes ends February 28th at 11:59pm ET. I would like to try the ultimate Cheddar Penne. The blueberry walnut clusters would be a great alternative to chips or crackers. Much healthier. The granola clusters would be great for my husband and my kids are always happy with mac & cheese. I am most interested in trying the blueberry walnut granola clusters. For those that aren’t aware, Walmart carries a large selection of Van’s products. I think the whole grain pasta sides sound delicious. I’d like to try the Rotini & Red Sauce first. Thanks for the review and givewaway! I would try the blueberry walnut granola. I love granola, and I eat it almost everyday. I am always on the lookout for healthier foods and these all look amazing! I would really like to try the Ultimate Cheddar Penne. I would like to try the mac & cheese first. The only one that I wouldn’t try is the herb and garlic. I’m not fond of garlic. I would love to try any of the Whole Grain Pasta Sides first! The Ultimate Cheddar Penne looks amazing! I’ve been trying to eat more whole grain whole wheat products lately. so I would like to try the Creamy Herb & Garlic. the granola looks really good as well. I would love to try the Blueberry Almond Granola Clusters. They look so good. First I would try the Cranberry Almond Soft Baked Granola Clusters. They have so many unique, delicious, and healthy food products to try! My kids would love the Ultimate Cheddar penne!